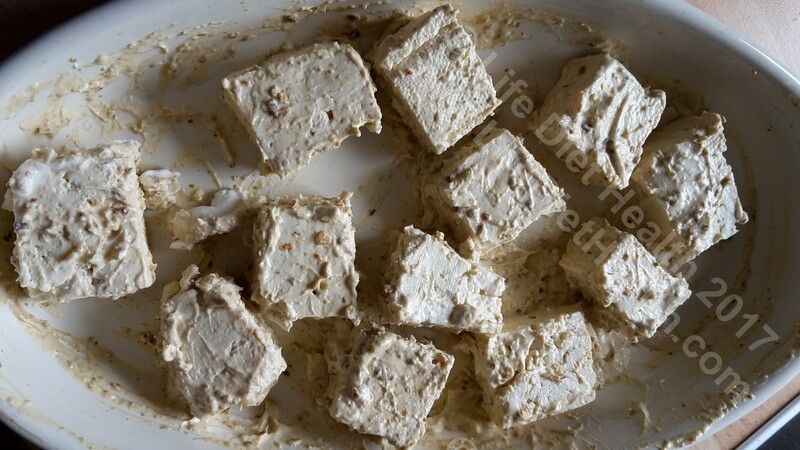 Tofu is great in that you can cook it in many ways to get different results. The most important stage which definitely should not be rushed is removal of the liquid. Tofu is very much like a sponge and no doubt it’s been sitting in water in its packaging. Whichever method you prefer is fine as long as you squeeze as much liquid out as possible! You could hand press it, wrap it in kitchen roll, squash it between two plates or even use a tofu press (yes, that is really a thing)! 😛 Next, the way you cut it – chunks, slices, wedges, cubes etc. affects how much flavour it absorbs and the final texture. Cubes too small get crunchy quickly and slices too thick don’t get the flavour all the way through! It’s best to experiment to find out what works best for you! The length of marinating doesn’t really affect tofu too much – although I would give it at least 30 minutes. Then of course there is the cooking method – you can grill, bake, shallow fry, fry to crisp then bake or even deep fry if you must! This recipe was a new idea 🙂 which I attempted to see if it worked! I made a marinade using yogurt (natural coconut yogurt) as the base and added lots of spices to give an Indian style dish. It worked! YUM! So, here it is – remember you can play around with the shapes and thicknesses of the tofu and with the cooking method… have fun and let me know how you get on! Get as much liquid as possible out of the tofu using your chosen method (I usually wrap a piece of kitchen roll around it and gently squeeze the liquid out over the sink, then wrap in fresh kitchen roll and repeat, then wrap once more and leave to soak up any remaining liquid). Cut your tofu into your chosen shape (I used large cubes this time) and place in a bowl. Put the yogurt in a bowl and mix in all the other ingredients. Add a bit of water or milk if it’s very thick. Pour this over the tofu and ensure they are all covered. Leave to marinate for at least 30 minutes before cooking. Place the tofu (spaced out) on a baking tray with any excess marinade and bake for 15-20 minutes at Gas Mark 4 (350f / 180c). The tofu should have a slight crunch with a soft inside. Alternatively you could shallow fry them in your choice of oil until cooked through. Ideally serve immediately but can be stored refrigerated for up to three days. Serve with your favourite grain – brown rice, millet, quinoa etc. Use to top a mixed salad. Add to a wider range of dishes such as daal, chickpeas or bhajees. Put in a sandwich with some salad and sauce! Can’t wait to try this! We struggle with the texture of tofu and know it can be good, but we haven’t mastered that technique.